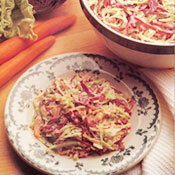 The Dutch cabbage salad, koolsla, arrived in America soon after the War of Independence. Today, many variations of the salad accompany sandwiches or fried chicken in diners, and this colorful version, tossed with a creamy sweet-and-sour dressing, is one of the best. Serve it alongside a triple-decker club sandwich. FOR DRESSING: In a large serving bowl, stir together the vinegar, sugar, mayonnaise, salt, pepper and parsley until well blended. FOR SALAD: Add the shredded red cabbage, shredded green cabbage and shredded carrot to the dressing and, using tongs, toss to coat all the vegetables evenly. Cover with plastic wrap and chill for at least 2 hours or for up to 8 hours before serving. Reprinted by permission of Weldon Owen. All rights reserved.